I'm naturally primed to find a deal. Lately Marshalls has served as the source of many of these deals. Every once in a while I like to peruse their racks for discounted home goods, gifts and possibly a little something for myself. 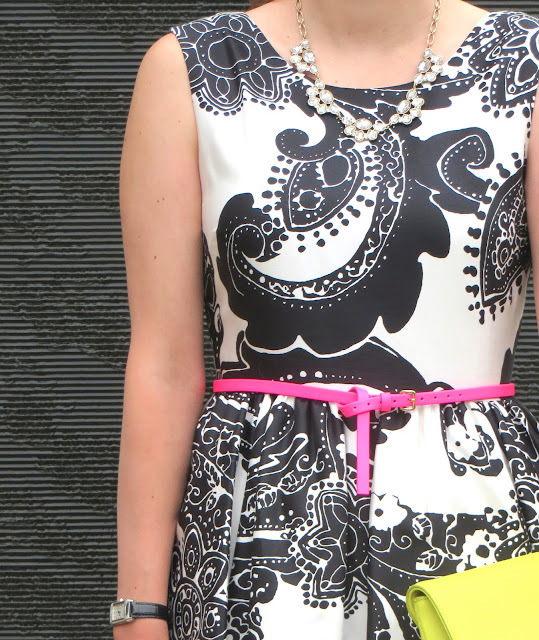 Recently, I was looking at Marshalls' selection of dresses and I found this Kate Spade Alanis Paisley dress on clearance for $65 (originally $500). Staring at the red clearance price tag was like a Kate Spade mirage, but once I got over my disbelief I knew that this dress was going to have to come home with me. 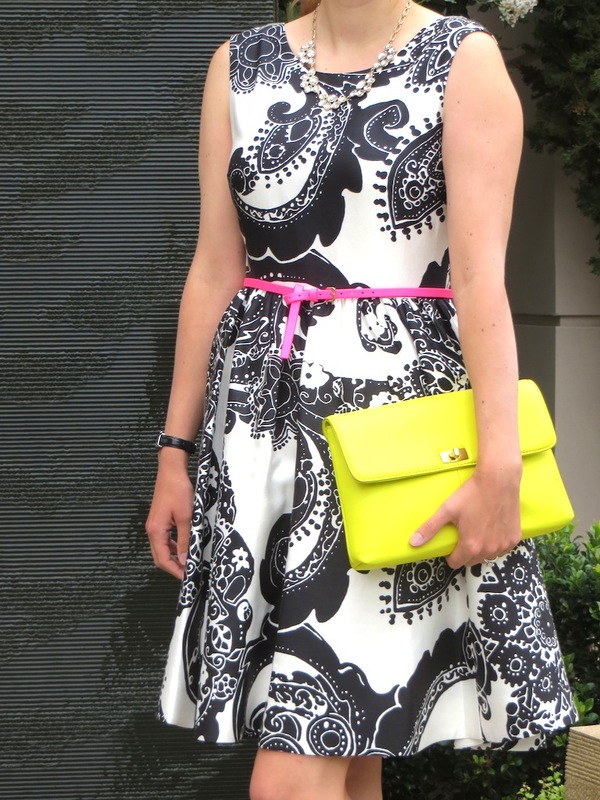 Last night I wore this Kate Spade bargain to Lawry's the Prime Rib in Beverly Hills. In the photo below I am standing next to a modern water fountain outside of the entrance. In case you are wondering why all the steak and eating out lately, the city of LA is currently endorsing an event called "Dine LA" in which local restaurants feature prie fix menus for a reduced price. It's a great time to go out and try new places or visit old favorites for a deal. I guess both the dress and my dinners lately are incredible bargains. The unique thing about Lawry's isn't really the cuisine, but rather the way they serve the cuisine (primarily prime rib) table side. The founder designed these gigantic stainless steel "silver" carts, which weigh 900 lbs when full and cost as much as a Cadillac, both then and now. (I spent some time reading the fact booklet they give you at the restaurant.) Just like in 1938, a carver comes to your table and cuts you off a piece of their succulent prime rib, cooked to your liking. They also spin a salad before your eyes and construct an ice cream sundae at the table. I didn't take any pictures of the pageantry of our waiter performing these tasks, but below you will see a glimpse of what it looked like back in the day. The current restaurant isn't much to look at from the outside; it looks like a typical "tilt up" style, big box building. I prefer to think about the way the establishment used to look, hearkening back to a time when people actually wore something other than jeans and a t-shirt to go out to dinner in (of which there was plenty of last night, much to my horror) and everything just seemed to be a bit more stylish. The interior, however, is nice with reproduction paintings and tapestries. Because these vintage photos of the restaurant are all in sepia, I manipulated the photo of my dinner to sepia as well to keep it consistent and to play up the idea of traveling back in time to classic LA. While the food may not come across as a visual masterpiece (as is the aim of many high end restaurants today), it's good, rich decadent food which allows you to travel back to a more elegant time in the history of Los Angeles. Wow, I would love to shop at your Marshalls! I never find anything at mine unfortunately. This dress is beautiful, and the pretty pink belt makes it even more fabulous. I have dined at Lawry's several years ago, and I remember the cart service was quite an experience! I never used to find anything at my Marshalls either and I almost stopped going. Now they are getting a ton of cute dresses (including Kate Spade) and some no-name type brands that look very "J. Crew inspired". Needless to say I check in every once in a while to see what they have! You're right that the cart service at Lawry's is quite impressive and certainly an experience! I went through the same thing as you in so far as debating which color to wear with the dress, but I thought pink worked best too. I bet yours looked adorable for the wedding.